A troubled woman living in an isolated community finds herself pulled between the control of her oppressive family and the allure of a secretive outsider suspected of a series of brutal murders. When Lee Israel falls out of step with current tastes, she turns her art form to deception. A customs officer who can smell fear develops an unusual attraction to a strange traveler while aiding a police investigation which will call into question her entire existence. A faithful Jehovah's Witness is forced to shun her own sister because of a religious transgression. As the separation draws out, she starts to question the meaning of God's love. A comedian uses her troubled past as material for her stand-up routine, trying to rise up through the comedy circuit by playing Northern England's working men's clubs. In her tiny island community, twenty-something Moll "Jessie Buckley" quickly falls for charming newcomer Pascal "Johnny Flynn". When he is named the top suspect in several murders around town, she defends him to her family but becomes doubtful as she sees his true colors. Geraldine James, Trystan Gravelle, and Shannon Tarbet also star. Written and directed by Michael Pearce. Clifford: This doesn't mean Pascal isn't bad news. And it doesn't change the way I feel about you. Moll: Do you know what I dislike most about you, Cliff? Q: Where is this filmed? Is it Jersey? Big mood, little payoff -- but a valiant directoral debut. Feature debut director Michael Pearce brings us a modern gothic romance that showcases an intimate spiral down insanity through its complex characters and eerie atmosphere. Pearce demonstrates an amateur eye with his low-budget approach to locations and static camera work yet shows potential as a new up and comer. The film has a well of thematic complexities that although are imbedded in our lead characters are sometimes too muddled and lost in their toxic relationship that anchors the plot. It's part mystery killer, part forbidden romance that attempts to balance the best of both but falls short of thought provoking enjoyment, straining the audience in the last half to stay engaged. Beast originally debuted at last year 2017's Toronto Film Festival, finally finishing its festival circuit one year later. So, after a year of generating buzz, how does it flare up? Beast is set in Jersey, a small island town off the coast in the UK that has recently been burdened with mysterious murders and disappearances of three young girls. The story focuses on Moll (Jessie Buckley), a detached and isolated young woman who through her oppressive mother and sick father, is commonly misunderstood by her high-class family. On the evening of her family birthday party, Moll escapes to go out dancing where she meets Pascal (Johnny Flynn), a ruffled yet fascinating young man who she befriends after he saves her from a drunken creep. As their relationship develops, Moll has to fight her inner demons, family conflict and growing suspicions as Pascal becomes a prime suspect for the recent murders. Jessie Buckley gives a strong, dynamic performance. Moments she is reserved and quiet, acting through subtle body movements and facial expressions, while others she is loud, frightening and does not hold back. The same can be said for Johnny Flynn, who plays the wit and charm of a scruffy Jersey local paired with a darker, more violent side to make his Pascal well rounded. The story's melancholy truly comes through via Buckley, but unfortunately that is all she is, a melancholic mess. As the film progresses the audience is put on a strain, as Moll lacks moments of likeability or relatability. The film chooses to show a bunch of corrupt and damaged people which doesn't leave the audience anyone to latch on to. This lack of engagement makes any ending for these characters unsatisfactory. Pearce excels in building tension and suspense. His scenes always have a sense of dread and ambiguity. He uses well timed ambient noise and a melodic score that when it isn't obnoxiously drowning an already depressing scene, is where the film stands out, creating a palpably anxious environment that we can't escape, mirroring its claustrophobic mood. There are messages it touches on such as oppression, solace, escape and redemption, but brushes on all four instead of harnessing one well first. It's murder mystery side plot almost seems a waste as it bleeds into the background for most of the film, where it could have easily shared the foreground with the romance. 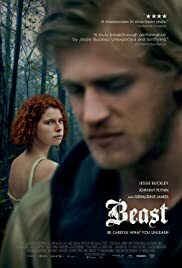 Beast overall is a rich indie effort that has a lot of ideas but seemingly leaves the audience emotionally unengaged, no matter how captivating the leads were. It's a valiant debut for Michael Pearce who although has no distinct style or voice as of yet, Beast shows he has potential. 12 of 19 people found this review helpful. Was this review helpful to you?